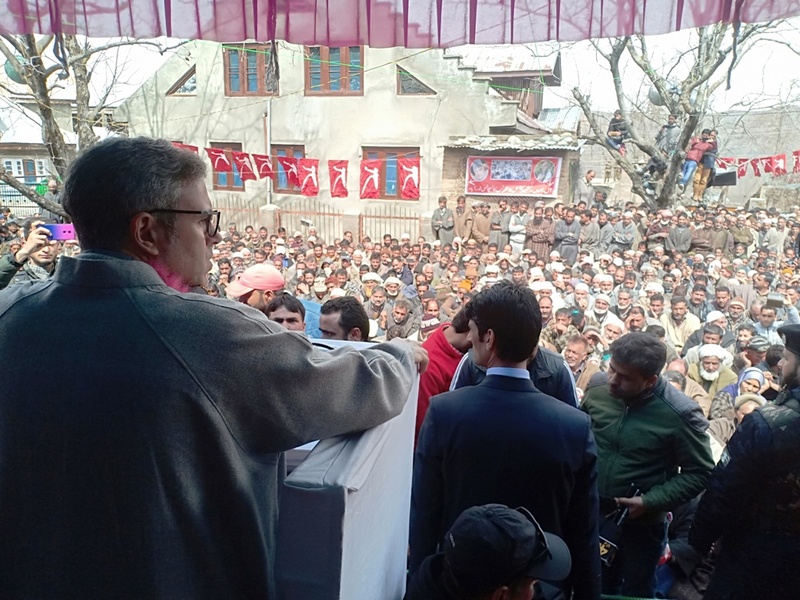 Jammu and Kashmir National Conference Vice President Omar Abdullah on Monday said that the embrace of Late Mufti Syed with Narendra Modi proved detrimental to the interests of State saying that the solution to the challenges the state is facing can only be overcome if NC is voted to power with a strong mandate. “I feel that the ban on JeI is thought-out match-fixing between BJP and PDP to help BJP save its face value in rest of the country and also help PDP milk the situation here in Kashmir. Nobody is going to be arrested. People are now privy to such election gimmicks and political tears as are only seen in their eyes at the time of elections,” he added. Omar said that the State would not have plunged into chaos had PDP not hobnobbed with BJP. “She didn’t care about the repercussions of joining hands with BJP. The only thing she had in mind was to save her party from disintegration. Had she not joined hands with BJP-RSS, Kashmir and it’s people wouldn’t have been subject to what we are going through right now. Today RSS takes out a procession in the broad daylight flaunting weapons. Who is responsible for it? Who helped them make inroads into the state?” he said. “Moreover when BJP withdrew support, Mehbooba didn’t ask the governor to dissolve the assembly. Had she asked the governor for dissolution of the assembly, the governor was bound to respect the constitutional obligation. But she didn’t with a sole purpose of keeping her flock together. Had the assembly been dissolved governor would have been duty bound to conduct the elections with six months and the state would have got a representative government,” he said. Earlier in the morning party vice president paid floral tributes on the final resting place of former speaker late Wali Muhammad Itoo and participated in the Majlis of Fatiha Khawani at his graveyard along with party functionaries. Among others party’s senior leaders including general secretary Haji Ali Muhammad Sagar, Mubarak Gul, Nazir Gurezi, Dr Bashir Veeri, Peer Mohammad Hussain, Abdul Majeed Bhat Larmi, Altaf Kaloo, Showkat Hussain, Gh Mohiuddin Mir, Imran Nabi Dar, Syed Tauqeer, also addressed the gathering. The leaders highlighted the services of late Wali Muhammad Itoo and paid glowing tributes to his legacy. Meanwhile, a meeting of the party’s parliamentary board was held at party headquarters Nawa- e- Subha, Srinagar. Party president Dr Farooq Abdullah presided over the meeting. The meet was attended by vice president Omar Abdullah, general secretary Haji Ali Muhammad Sagar, provincial president Kashmir Nasir Aslam Wani, provincial president Jammu Devender Sigh Rana and other leaders.